Jaipur : Vodafone India has embarked on a customer outreach programme in Rajasthan, titled ‘Aao Milein’. 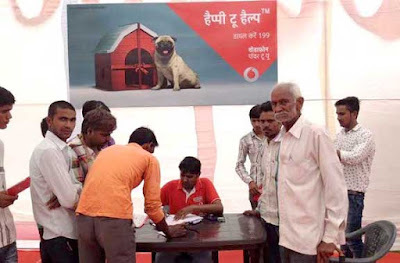 Initiated with the objective of providing easy access for existing and new customers to connect with Vodafone and seek addressal to their mobile connectivity needs, Vodafone ‘Aao Milein’ is being activated in the form of service camps being set up at local ‘Haats’ across towns in the state with 5-10 thousand population. The Aao Milein programme will be conducted in the format of a mobile store/ service station, across 7 key zones in Rajasthan, connecting with over 2 lakh people across 20 towns and villages, over a period of 40 weeks. Each Vodafone ‘Aao Milein’ mobile Customer Experience Centre has been designed as a one-stop-shop for customers. There are seven sequential walkthrough counters to facilitate requirements pertaining to Customer service, VAS & Data, Products and Services, M-Pesa, Sales counter. Additionally there will also be a Games and Refreshments counter to engage more closely with the local populace. Extending a warm welcome to the citizens of Rajasthan to participate in Vodafone ‘Aao Milein’ Amit Bedi, Business Head – Rajasthan, Vodafone India said, “In Rajasthan, Vodafone has a customer base of more than1 crore, hailing from diverse socio-economic and demographic backgrounds. So far, Vodafone ‘Aao Milein’ Mobile Customer Experience Centres have covered Anta (Kota), Anoopgarh (Sriganganagar) and Revtar (Sirohi) and local residents have responded very positively to the initiative.